The biggest trends in fashion today are ones no one wants to be seen in. They include vastly increased clothing production and declining use, massive levels of waste and more greenhouse gas emissions than international shipping and flights combined. 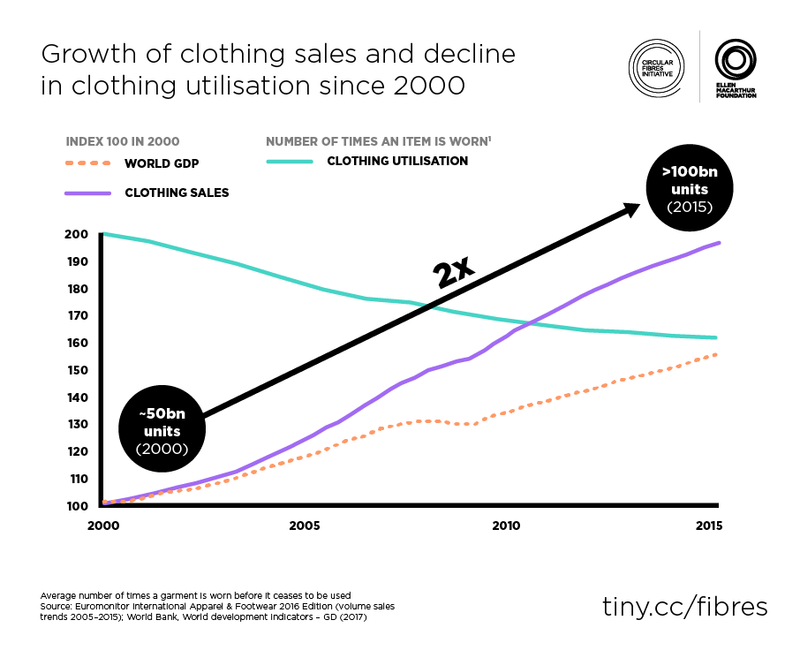 In the last 15 years the industry has doubled production, while the time clothing is worn before it is thrown away has fallen by around 40%. When it is thrown away, 73% will be burned or buried in landfill. What does get collected for recycling – around 12% – will likely end up being shredded and used to stuff mattresses, or made into insulation or cleaning cloths. 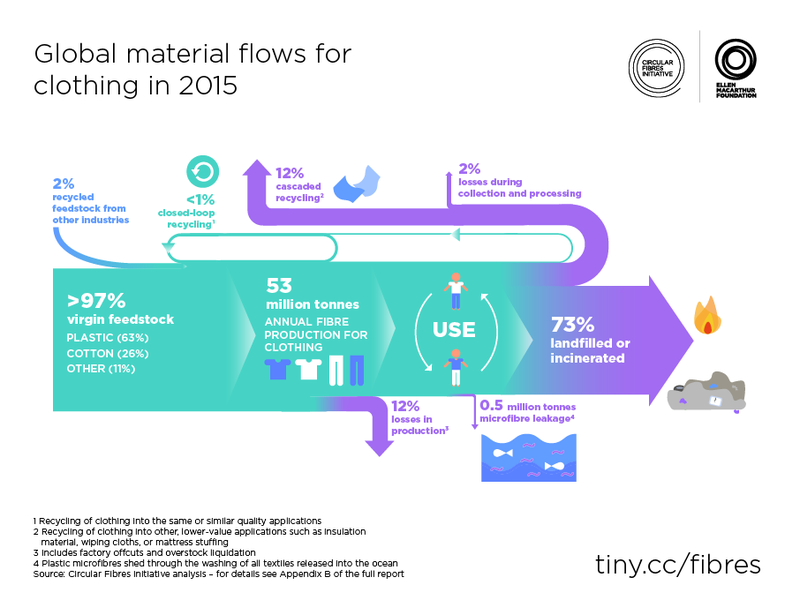 Less than 1% of what is collected will be used to make new clothing. These trends are not only damaging the environment, they are limiting the opportunities for the fashion industry to succeed in the long-term. The industry already misses out on $560 billion in value from clothing being worn less and barely recycled. As well as this stark economic reality, fashion is facing increased scrutiny from policymakers. In the UK last month, for example, members of parliament recommended the introduction of extended producer responsibility on clothing, effectively taxing brands to help meet the costs of dealing with clothing when customers have finished with it. Customers themselves are increasingly calling for change. Just as they did with fur and workers’ rights in clothing factories, they are demanding companies look seriously at issues like plastic microfibres, massive levels of waste, and greenhouse gases. It has become clear that for the fashion industry to thrive in the future it needs a fundamental redesign. It has the opportunity to shift from the take-make-waste model that characterises it today by embracing circular economy principles. 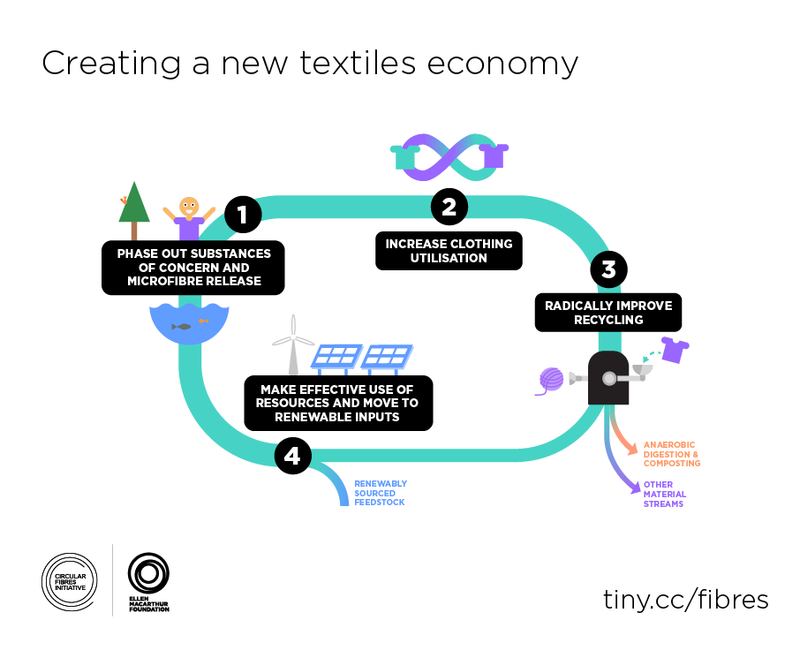 Such an approach would see business models increase the use of clothes, clothes made from safe and renewable materials, and old clothes used to make new ones. By adopting this framework, the fashion industry can start to break away from the zero-sum game it has found itself in: where efforts to improve outcomes can be at odds with economic imperatives. Instead, by designing out waste, keeping materials in use and regenerating natural systems, it can realise new areas of growth by meeting customer needs in new ways and providing environmental benefits. Some players have already started to realise the potential for business model innovation that pushes in this direction. Clothing rental and resale are surging in popularity, with market disruptors such as the RealReal, Rent the Runway, and Depop capitalizing where traditional brands have been slower to act. Online reseller Thredup predicts the total resale market to reach $41 billion in 2022. According to Forbes, used-merchandise stores on the high street are among the fastest-growing sectors in retail, up 7.6% in the first half of 2018 following an 11.6% gain in 2017.
Business model innovation must be matched by a design rethink. Providing designers -– the creative heart of the fashion industry – with the tools to design for circularity is essential to make fashion circular. By focusing on how a product will be made, how it will used, and what will happen to it afterwards, designers can unlock the full value of clothing – rather than seeing it lost to landfill, or go up in smoke, as so often happens today. Thoughtful design coupled with innovative business models can make the end of one customer’s experience with a garment the start of countless other journeys. One such route could be repairing or customising a garment; another could be swapping, donating or selling it. If it has been made from safe and renewable materials, and made to be made again, it can feed back into the system and be used to make new clothing. Fashion is too inventive to be trapped in the linear model. The circular economy is an opportunity to harness the passion and creativity for which the industry is famed in a way that goes beyond securing its future and allows it to thrive.